The P036-003-15A Heavy-Duty Power Extension Cord is the perfect replacement for a lost or worn-out power cord. 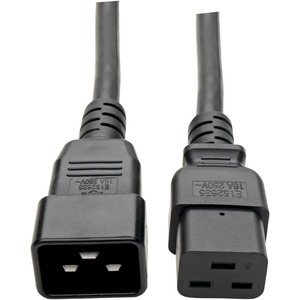 Plug the male C20 connector into an AC power receptacle or rack-mounted PDU or UPS system, and connect the female C19 end to a network device that requires a heavy-gauge power cord, such as a server, router, network switch or blade server. Or you can use the cord to extend your current power connection by three feet (one meter). High-quality connectors feature molded construction to last a long time and integral strain relief for a secure connection. The heavy-duty SJTW jacket contains three 14 AWG conductors and a 15A rating.